Leaving warm and sunny New Zealand for a Canadian winter is not something that one dreams of when they think of taking a break. But when engineering student Daniel Gray found himself visiting his girlfriend’s family in the Great White North, he figured out a fun way to keep busy during the long, -25 degree days. His girlfriend’s mother challenged him to build an igloo in the family’s backyard, and being more than up to the task, Gray managed to construct a wondrous rainbow igloo made from 500 bricks of colored ice! Leaving warm and sunny New Zealand for a Canadian winter is not something that one dreams of when they think of taking a break. But when engineering student Daniel Gray found himself visiting his girlfriend's family in the Great White North, he figured out a fun way to keep busy during the long, -25 degree days. 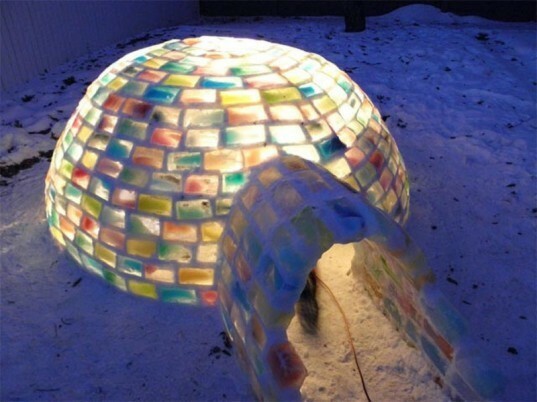 His girlfriend's mother challenged him to build an igloo in the family's backyard, and being more than up to the task, Gray managed to construct a wondrous rainbow igloo made from 500 bricks of colored ice!